The crowd packed into the 1,500-seat East Pyongyang Grand Theater gave the South Korean performers a thunderous standing ovation. North Korean leader Kim Jong Un professed to be "deeply moved" after South Korean pop stars performed in his country's capital as part of a significant thaw in inter-Korean relations. "We should hold culture and art performances frequently," Kim told the performers, according to South Korean reporters traveling with the artists. Video and photos from the event showed Kim applauding and waving at the artists, including some K-pop performers. His wife, Ri Sol Ju, and hundreds of other citizens watched the rare performance, sometimes waving in time with the music. After the two-hour performance, the North Koreans gave a thunderous standing ovation. The group of some 160 South Korean artists flew to Pyongyang on Saturday for two performances in the North Korean capital. Sunday's concert entitled "Spring Is Coming" was held in the 1,500-seat East Pyongyang Grand Theater, and showcased an elite lineup of performers, including veteran vocalists Cho Yong-pil, rock star Yoon Do-hyun and the popular K-pop girl band Red Velvet. The performance came just weeks before Kim is due to meet with South Korean President Moon Jae-in on April 27, highlighting lessening tensions between the rivals after years of friction over the North's nuclear program. The North Korean concertgoers — most of the men in dark suits but some women in colorful traditional "hanbok" dresses — waved their hands from their seats when the South Korean stars sang the popular "Our wish is unification." Kim "said that he was deeply moved to see our people sincerely acclaiming the performance, deepening the understanding of the popular art of the South side," according to KCNA. Images captured by South Korean journalists showed Kim shaking hands with the performers and stopping to pose for a group picture. After the concert, Kim referred specifically to Red Velvet, a K-pop sensation hugely popular in South Korea. Red Velvet member Seulgi said she cried when North and South Koreans together sang "Our Wish is Unification." Another member, Yeri, said she was "very" nervous when she exchanged handshakes with Kim, but added that it was "an honor" to do so. Technically in a state of war since a 1953 armistice, the two Koreas are divided between North Korea, officially the Democratic People's Republic of Korea, and South Korea, officially the Republic of Korea. The concerts came after years of U.S.-North Korea tensions, with the North conducting ballistic missile launches and testing a hydrogen bomb last year, and President Donald Trump engaging in fiery rhetoric with Kim. But in a surprise announcement on March 8, South Korean officials announced that Trump would hold talks with Kim. 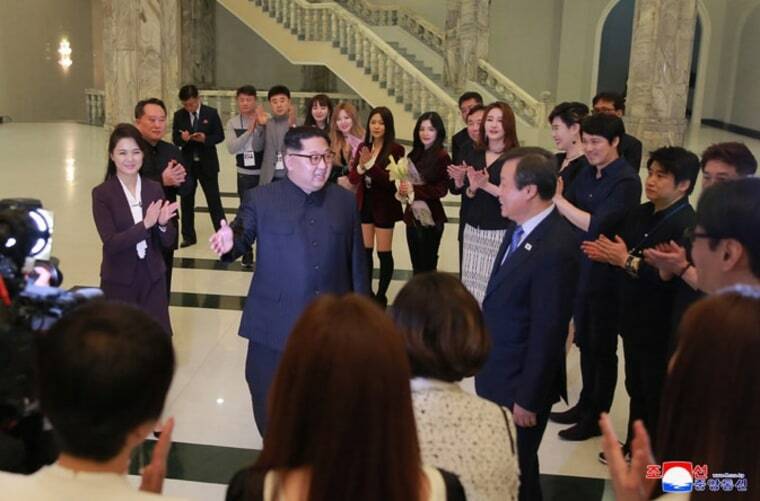 South Korean pop singers performed in the North during a past era of detente, but it was the first time a North Korean leader had attended a South Korean performance in the North's capital. Sunday's performance coincided with the start of annual joint South Korean-U.S. military drills, which have previously been met with denunciations by the North, but which were delayed and shortened this year so as not to overshadow the Olympic detente for the recent Winter Games in PyeongChang, South Korea.